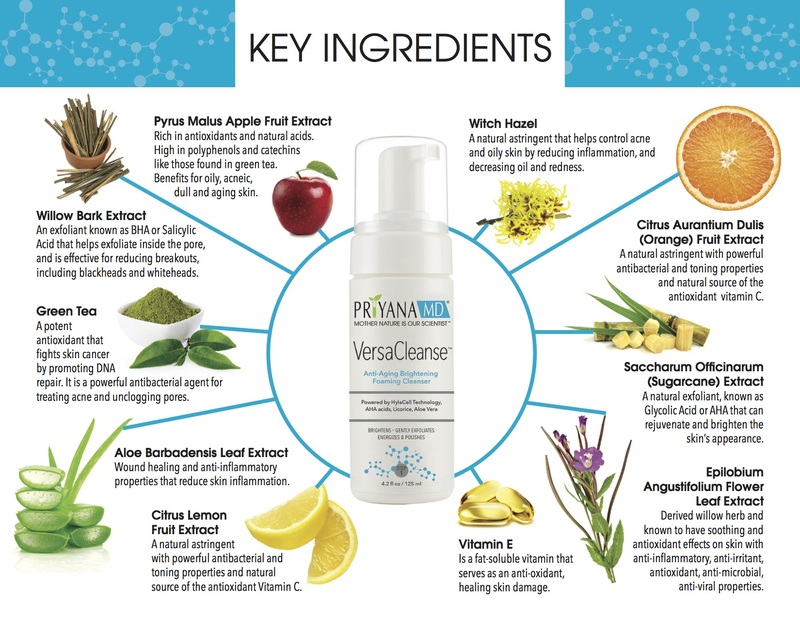 VersaCleanse® uses HylaFoam® technology housing 5% AHA and BHA acids designed specifically to remove dead skin cells, reduce pore sizes, reduce dull lackluster skin and help to brighten the skin. It acts as a facial-treatment wash assisting with improving skin tone, texture and clarity - to reveal brighter, more radiant skin. Our best selling cleanser is formulated with powerful active ingredients, antioxidants, glycolic acid, salicylic acid, aloe vera, green tea, licorice and witch hazel to restore beautiful skin and deliver instant radiance and brighter complexion. Helps to deliver instant radiance and brighter complexion. The unique HylaFoam Technology drives active ingredients into the skin by removing dead skin cells through our MicroFlake Technology, resulting in no down time or visible signs of exfoliation. The active ingredients suspended in foam are able to work invisibly to have the most profound exfoliation and brightening capabilities. The foam also allows easy gliding across the skin, leaving noticeable improvements in lines/wrinkles, pigment and overall skin rejuvenation. Our HylaFoam Technology was created to allow skin care professionals to apply VersaCleanse without the use of water as some treatment rooms are not equipped with plumbing. Estheticians use VersaCleanse to jumpstart their treatment by removing skin impurities, makeup, and oil/dirt. The foam is simple to remove with gauze and water and can also be easily rinsed off. With VersaCleanse, the skin looks radiant and is ready for the next steps in skincare treatments. Apply 1-2 pumps to dry or damp skin and rub gently. Let sit on skin for 10-30 seconds. Remove and pat dry. VersaCleanse® Hydrate Gel Cleanser arrived with a broken dispenser. Very frustrating after an expensive buy. I Love PriyanaMD Growth Factor creams and lotions for replenishing and rejuvenating my (almost) 60 year old skin ! No other product has made my skin feel so moisturized and healthy - I especially love the HylaCell GF night cream and VersaBright Daily C. Although I can pick these up in my doctors office, ordering onIine is quick and easy and my shipments arrive quickly ... thank you !! I was having adult zits on my chin when I started using VersaCleanse everyday and now my chin is clear and has been for months! We can’t keep this cleanser in stock in our busy Dermatology office! People love it and their skin looks great! Little goes a long way...Great acids Glycolic and Sakicylic that deliver skin lightening benefits and keep the pimples away! LOVE this! My face is clean and I don't get as oily during the day. Will continue to buy! Hailey loves it. She says she can feel it working! This is the best cleanser that I have used. I have tried many other products on my face but this one is the best. It comes out as foam and washes your skin so well that it feels and looks wonderful. This product smells great too! I feel like most facial cleansers are either gentle OR effective (and harsh). With this cleanser, I've finally found a face wash that is gentle on my skin but also effective at fighting my acne. I'm very happy with this product and plan to use it for the foreseeable future!